It also lessens the load of a huge download on our computer systems which sometimes happens with other versions of digital books and interactive media. It also allows for high quality videos to be included with a series of PDFs. The flash drive is accompanied with written instructions. Once you open the flash drive folder on your system, you’ll also find a technical instruction PDF which includes a list of all the different PDFs and videos included in the book as well as technical information about what software you might need to have on hand in order to view the videos and where to find it. Once you are ready to view the material, there are two options – an interactive ebbok option for reading on-screen with clickable links to the videos, and a second option which is printable. In the book itself, Susan describes supported spinning, advantages and disadvantages and then offers five main sections to follow or read up on -Fiber, Fiber Prep, On the Spindle, Off the Spindle and accompanying Appendices. She also goes a little farther to offer asides beyond the general descriptions, including useful tidbits, warnings and alternatives to standard practices. Each section is robust. The Fiber section covers everything from source to microns to staple length, crimp. Animal fibres covered include wools, cashmere and pygora, angora, mohair, llama, alpaca, vicuna… the list goes on and on; silks are next (sari, cultivated, noil), and then plant fibers of all imaginations, and eco ‘junk’ fibres such as Chitosan in the form of Crabyon© and, finally, a miscellaneous section of fibres which go beyond classification such as Firestar and feathers. In short, the fibre section of the book is spectacular and could be, quite happily, a separate book unto itself. The preparation section is equally spectacular and continues into spinning techniques to employ to produce specific types of yarn. Eventually, we get onto the spinning. This is the part which most interested me (but I did find the fibre sections extremely educational, nonetheless). I would classify my spindle-spinning technique as being late-beginner. I don’t do a lot of drop-spinning, but it has a place in my fibre production as being something do do in the summer which isn’t quite as heavy (and sticky from the humidity and heat) as wheel spinning (mostly because it utilizes smaller amounts of fibre at a time). And it’s a fun takealong when on the move or visiting friends, especially when it’s too hot to knit). I do, in general, more wheel spinning than spindling (our Canadian summers are short which cuts down on drop-spindle time). So I am interested in supported spinning techniques which I know next to nothing about. So, onto The Spindle. Spindles which lend themselves to supported spinning are covered. History, traditions, background, shapes, etc., it’s all in this book. Included also is an illustrated how-to tutorial about making a beaded spindle. I am fairly certain I have the materials required in the house. So, I might just try to make one after dinner. All of this information leads to Spindle Anatomy. This is the stuff I need to know and anyone looking for this information will not be disappointed. There is also information about different woods and a section on spindle and bowl makers which includes a demonstration of how a spindle is hand-turned, including the staff and the tip. Then, finally. Technique. Here, twirling, drafting, building a ‘football’ cop, how to make plying balls and a trouble-shooting section to help fix any issues you might encounter. Then we come to ‘Off the Spindle’. Here the book delves into twist, grist, TPI, WPI and just about any other tool or determination you would use to figure out what kind of yarn you’re making, and whether it might be over or under-twisted. Next, we have plying techniques, winding and tying skeins, and finally, finishing the yarn and a section showing how gradient and other handspun yarns look once they’re knitted. The section on bowls is delightful, showing all sorts of bowls which are anything but plain. Finally, storage and transportation is covered, along with record-keeping. Appendices cover fibre measurements, spindle and fibre vendors, a chart showing which type of spindle will spin the longest empty, recommended reading and a glossary. Peppered throughout each section are links to websites and online forums where one might glean even more information than what is offered in the book. I have not yet ventured into the videos. I intend to once I read through everything again and see about putting it to work for me. The video titles, however, indicate techniques for drafting both left- and right-handedly. They also cover carding and combing, different plying techniques, and lots of different spinning formats (including semi-continuous, over-the-fold). In short, this book is stupendous. I can’t imagine anything could possibly be lacking from this book. 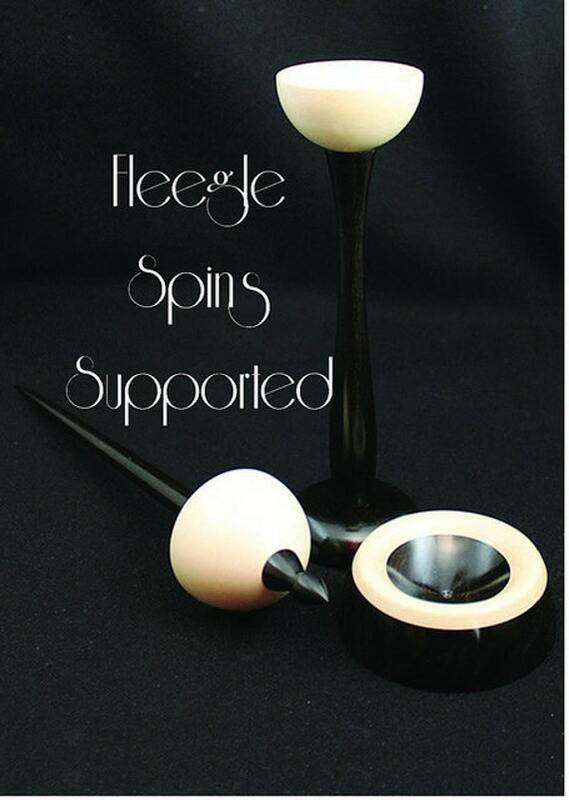 I would also venture to recommend it to general spinners, not just for spindlers or bowl-supported spinning. The reference provided for general spinning knowledge is really over the top. A well-done book all around. Spin-along with us on Ravelry in February! Next story Cook While You Spin : Got Rhubarb?